R1 RoadsterÂ Design Build and Drive System Single. 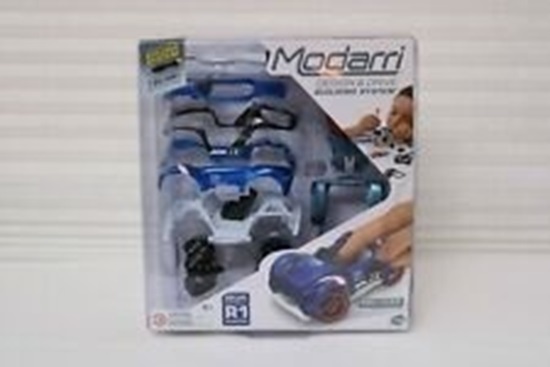 Build yourÂ own Modarri coupe, decide on what partsÂ that areÂ needed. This set you are purchasing hasÂ 13 (including wheels)Â pieces, which can create 10Â variations of the car. The screws stay in place and do not get lost. There is a screw driver provided , that fits all the screws. Register you car at Modarri.com The car's license plate unlocks free stuff for the child. SET INCLUDES: Modarri R1 Roadster.13 Mix and Match Parts IncludedÂ Â concept Car Hood and Fender,Â T1Â Hood,Â Car Frame,Â T1Â Car Chassis,seat,Â 4 Wheels,2 Suspensions &Â Hex Tool.